Blizzard used their @Diablo twitter account to drop another hint about what Diablo 3 is using for a skill organization system, now that skill trees are (apparently) gone for good. That said, the Dungeon Siege (and Ultima Online, the game that the DS combat engine was supposedly modeled after) design was to provide a variety of skills and combat abilities, all of which would improve as a character used them. It was necessary to use them frequently and successfully, and against higher level foes, to keep improving them. This design necessitates a cap to the total amount of skills that can be mastered, and eventually your character’s ability at the less-used talents atrophies if you keep upping your proficiency at new ones. To translate this into D2 terms, imagine that through long practice and careful use of just a few certain skills, your Barbarian has 98% mastery with Whirlwind, 95% with Frenzy, and 100% at various passives. For some reason, you decide to start using Berzerk a lot, and as you do, your Berzerk expertise starts to increase. You’re Berzerking at 14% ability, then 25%, then 51%, and so forth. But you’ve not used Frenzy all game, and since you were at the max total ability cap, the increase to Berzerk has to come off of something else. Thus bye-bye goes your Frenzy expertise. That’s a very simple hypothetical example, and obviously there are many variables to be factored in. If they went this path, the D3 Team would have to tweak how fast characters gained expertise at new skills, how fast skills lost points, how often you had to use a skill against a challenging enemy to keep it from atrophying, how the gain/loss worked with passives you couldn’t use (or not use) on purpose, etc. But it’s an interesting topic for debate. Do you guys like this concept? Hate it? Not believe it’s a viable for a Diablo game? 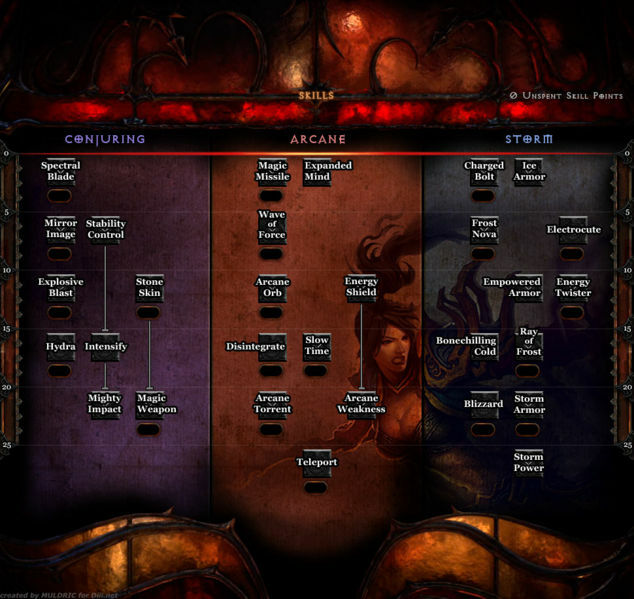 Also, if anyone with a lot of experience with Dungeon Siege wants to elaborate on how the skills/abilities were arranged in that game, and how they compare to D2/D3’s skill tree format, please enlighten us in the comments. Update: Bashiok commented on the skill tree change, without spilling any secrets, in the B.net forums as well. Click through for that. People sure are running wild with interpreting what it could be, which is fun for us to read at least. We’ll see how it works out. It’s still really only been tested in ideas and theory and messy whiteboard scribblings. Might be that it just doesn’t work and we go back to the system we had post-Blizzcon, which in reality worked just fine. But we think we can one-up it a bit. We’ve been iterating the entire time so really the newest tweet about trees going away wasn’t the first hint, but it certainly contained a more concrete change in its text.